Being the most mountainous and one of the most celebrated areas of France, it is no surprise that the region containing the French Alps has plenty to offer. Its idyllic mountain scenery is proving to be more and more popular with people hoping to buy property in France. Forests, rivers, lakes and gorges make it a haven for the more adventurous sports enthusiasts, both during the summer and winter. The climate various from season to season, however changes in temperature are extreme - ranging from hot sunshine in the summer to extreme cold during winter months, which will also bring an influx of tourists during the ski season. Whilst communication links are by no means bad, don't forget that there is no airport in the southern French Alps. The nearest airport is about a two-hour drive away. Airports within Rhône-Alpes include Grenoble, St Etienne, Lyon and Chambéry. And of course there is Geneva, easily accessible and served by a multitude of airlines. Meanwhile the TGV trains from both Lille and Paris stop at Valence, so it is a simple journey from/to the UK using the TGV and Eurostar. There is also a weekly rail service service from London St Pancras to Geneva which takes just over eight hours. There is no motorway from Grenoble to Briancon, so be prepared. After Paris and the Côte d'Azur, Rhône-Alpes is the third most popular tourist resort in France. The good news for those looking to buy property here is that prices are considerably lower than those of Paris, albeit still above the national average. It's worth remembering that prices in the southern French Alps are generally lower than those in the north. Do you know Rhône-Alpes better than we do? Do you have photos of Rhône-Alpes? The diverse terrain of flatlands, agricultural plains and mountains make the Ain an ideal area for hiking. Property is reasonably expensive close to the large towns, but becomes more affordable in rural areas. The Ardeche has always been popular with people seeking adventurous holidays. The department has a climate similar to that of Provence and is home to such natural spectacles as the Gorges de l'Ardeche and the Pont d' Arc. The Drôme is a fantastic base for exploring both Provence and the Alps. It is home to many hidden wonders and fascinating small towns. France's largest nature reserve is to be found here, inside the Vercors, a unique area of natural beauty. Isere is perhaps most well known for its capital Grenoble - host to the 1968 Winter Olympics. The area is renowned for its winter sports but also has much else to offer the visitor. Several Regional Parks present excellent walking routes, whilst historic monuments such as the Bastille Fort and Chartreuse's monastery provide cultural interest. The dynamic Loire department, located just to the west of Lyon, has always been a centre for industry. Today it is undergoing considerable modernisation with towns such as St-Etienne leading the field with new technology. It has some of the cheapest properties in the Rhone-Alps. The Rhone's strategic location means that the area has been of immense economic importance over the past few centuries. Its capital, Lyon, is France's second largest city and is renowned as a centre of gastronomy. Foreign buyers are not evident in the property market in Lyon where house prices are high. There are cheaper properties, however, between La Clayette and Tarare, a wine producing area. With over 60 ski resorts to choose from, it's easy to see why Savoie is so popular as a winter destination. But this area has much to attract visitors all year round. Once the snow melts, the range of leisure activities includes hiking, white water sports and mountain biking. Chambery, the capital city is a fascinating place to explore with its maze of cobbled streets. Abondance is a Savoyard village which is everything a mountain village should be. Straight from a picture book, the pretty, traditional buildings and glorious surroundings make Abondance simply enchanting, whatever the season. Aime is a lively village which is found in the lovely Tarantaise River Valley in the Savoie department of the Rhone Alps in eastern France. Surrounded by glorious mountain countryside with views to Mont Blanc, Aime makes a great base for skiing and mountain tourism, as it is close to the Paradiski and Three Valleys ski areas. Albertville is a town which lies in an Alpine valley, close to the border with Italy, in the Savoie department of the Rhône-Alpes region in eastern France. Once the venue for the winter Olympic Games, Albertville has been designated a town of Art and History since 2003. Alpe d'Huez is both a mountain and a ski resort in the French Alps. It is perhaps most famous for its role as the most notorious mountain climb in the Tour de France, and since it was first used for the race in 1952 it has rarely failed to feature. Annecy, capital of the Haute-Savoie department in the high French Alps, is sometimes seen as the Venice of the Mountains, due to its romantic canals and ambience. What sets it apart, however, is the reflections in the water of the towering Alps which sit behind the town…Venice was never like this! The city of Annemasse, which sits right up against the Swiss border, constitutes the second largest urban development in the Haute-Savoie. It is, however, despite its many shops, supermarkets and commercial enterprises, a large city with a small town outlook on life. Close enough to Geneva to be a satellite town, Annemasse remains calmer and more down to earth than its Swiss neighbour. Stunning mountain scenery, some of Europe's best skiing on the doorstep, lively and friendly après ski, a superb local gastronomy and a picturesque, traditional village are just some of the reasons why you might want to consider buying or renting a property in the Alpine village of Argentière. Argentière lies in the Haute-Savoie department of the Rhone Alps, and makes a delightful base for enjoying the multitude of activities found in this glorious part of the country. Avoriaz is a family friendly ski resort that's a little bit different from the rest. Not in its skiing - that's still superb and offers access to the same great pistes and facilities of all of the neighbouring Portes du Soleil resorts. What marks Avoriaz out as unique is its unusual architecture. Purpose built to a futuristic design, Avoriaz is neither an old fashioned village resort nor a run of the mill modern one. So, if you're looking for an affordable ski resort that's just a little out of the ordinary, try Avoriaz. Beaufort is a beautiful Savoyard village set in the stunning surroundings of the French Alps. Perfect as a base for summer or winter holidays, Beaufort is also connected to the ski resort of Arèches Beaufort. Bellevaux, a town and ski resort of the Haute-Savoie department in the Rhône-Alpes region of eastern France, is ideally placed for providing access to some of the best skiing in the Alps. Bellevaux translates to "beautiful valley", and indeed, the surroundings of the town are quite spectacular, with landscape features including soaring peaks and snowy slopes, lush mountain pastures and wildflowers, crystal lakes and waterfalls. The mountain village of Bernex is located in the Haute-Savoie in eastern France, south of Lake Geneva and within easy reach of the Swiss border. Perfect for enjoying the beauty of the mountains and all their sporting opportunities, the village is delightful in any season, and offers excellent facilities for holidays or full-time living. Bonnevaux is a small village that is part of the Val d'Abondance area of the Haute-Savoie department of the Rhône-Alpes, in eastern France. Set in the most picturesque of surroundings, with the Alps ever present and close to the fabulous Lac Léman (Lake Geneva), Bonnevaux is peaceful and pretty, yet within easy reach of some of the best skiing in the region. Bonneville is a rapidly developing town in an enviable position in the foothills of the French Alps. Popular with residents and tourists alike, the atmosphere is both green, in terms of the unspoiled beauty of the natural resources, and also dynamic in terms of the development of the town, its industries and robust economy. Bourg Saint Maurice is known as the gateway to the Alps. It is, however, a delightful little town in its own right, with pretty cobbled streets and a traditional and delicious gastronomy. The Alpine village of Bozel, which lies in the department of Savoie close to the Italian border, is an old Savoyard village with a real history and culture, not a purpose built ski resort. It does, however, have access to some of the best skiing in France, as it is located in the heart of the Three Valleys ski areas. The village of Brides les Bains, in the Savoie department of the French Alps, has long been a popular destination for Brits and other nationalities. This will come as no surprise to those who already know the attributes of the village, which has heath spas, access to Meribel for skiing, scenic surroundings and an interesting heritage to boot! Chambéry, the capital of the Savoie department in the French Alps, is a fascinating and vibrant city. Set in the valley between the Chartreuse Massif and the Bauges Mountains, it not only has superb access to the ski resorts of the mountains, but also is perfectly placed for accessing the passes into Italy. Chamonix is a name that is synonymous with the very best of Europe's skiing and mountaineering. The resort, which is a traditional village rather than a purpose built resort, lies high in the French Alps in eastern France. It has the distinction of being close to both Italy (at around 20 minutes drive through the Mont Blanc tunnel), and also to Switzerland (accessed over the Col des Montets pass). The village of Champagny-en-Vanoise, which lies in eastern France in the Savoie department of the Alps, is more than just a ski resort. Equally beautiful in winter or in summer, the village is a tranquil and friendly place which welcomes visitors warmly, and which prides itself on its unspoiled nature and Savoyard heritage. The ski resort and village of Chamrousse is found in the Isère department of the Rhône-Alpes, in eastern France. Chamrousse is a friendly and well equipped resort, ideal for family skiing holidays. It is easily accessed from the UK via the airports of Grenoble, Lyon or Chambéry. All levels of skiers are catered for in Chamrousse. The village of Châtel lies almost on the border with Switzerland in the French Alps. It is not only a beautiful, historical and fascinating Savoyard village, but also a ski resort, a summer and winter adventure sports resort and a place where you can relax and enjoy one of the most beautiful and unique mountain regions in Europe. The village of Chevenoz is found in the Haute-Savoie department of the Rhône-Alpes region in eastern France. It is one of six villages that make up the community of Abondance, famed for its cheeses as well as its magnificent mountain scenery. Chevenoz is close to the ski slopes and resorts of the Alps, and also near to Lake Geneva. Cluses is an elegant Alpine town that lies between Lake Geneva and Mont Blanc, giving it a superb geographical location that benefits not only from the proximity of both Italy and Switzerland, but also by offering superb access to the mountain slopes for winter and summer sports and tourism. The village ski resort of Combloux lies in the east of France, in the Haute-Savoie department of the Rhone Alps region. Unlike many large resorts, Combloux is completely authentic and brimful of traditional Alpine charm, perfect for those with families, or for those who simply love the good skiing, friendly atmosphere and the awe-inspiring beauty of the mountains. Cordon is an Alpine village set amid the most stunning scenery in France. Completely traditional and unspoiled, the village has commanding views of Mont Blanc as well as access to excellent skiing. 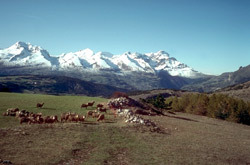 Cordon lies in the Haute-Savoie department of the Rhône-Alpes, in eastern France. Courchevel is best known as the ski resort of choice for the rich and famous? but this is only part of the story. Courchevel, in the French Alps, is actually four separate resorts, each with its own characteristics, clientele and pricing! The town of Crest is situated in the Drôme department of the Rhône-Alpes, in south-eastern France. Crest is popular with tourists as not only is it a very attractive old town in a beautiful area, but it also boasts the highest tower in France. This is the castle keep, which sits on the hilltop above the red rooftops of the town. Crest Voland is a little Alpine ski resort that sits in the Savoie department of the Rhone Alps region in eastern France. Small and friendly, it nevertheless offers excellent skiing for beginners and intermediate level skiers, and has plenty of facilities for non skiing (and summer season) activities too. The town of Die, located in the south-east of France in the lovely department of the Drôme, is a beautiful town despite the English interpretation of its name... which, by the way, is pronounced "dee"... not "dye"! If spending time in the stunning French Alps means not just access to great skiing but being part of a traditional, Savoyard community, then Essert Romand could be the place for you. This picturesque village is a tranquil haven in the mountains, yet it is just five minutes from the popular town of Morzine which offers a lively daytime and night-time scene. The spa town of Évian-les-Bains is world famous for its bottled water, and it is frequently the mineral water choice of the rich and famous. The town, from which the water springs and from where it is bottled, is every bit as elegant as its reputation. It possesses a relaxed beauty that makes it a perfect place to escape the stresses and strains of everyday life. The resort of Flaine, in the Haute-Savoie department of the French Alps, is a superbly designed purpose built ski resort which attracts all types of skiers, and is especially suited to families. What it lacks in traditional charm it makes up for in excellence of design and location, and all conceivable creature comforts are not only on hand but also instantly accessible. The resort also benefits from stunning natural scenery. Flumet is a ski village that is located in the Savoie department of eastern France. Located in a beautiful Alpine valley, its snowy winter vistas and green summer meadows make it picture perfect in anybody's book. Grenoble, that grand old lady of the Alps is more than just the capital city of the Isère department. Grenoble is considered by many to be the capital of the French Alps, a place which is a byword for not only some of the finest skiing available, but also for a vibrant city where an exciting modern life sits side by side with history and culture. Hauteluce is a picturesque Alpine village which is built in traditional Savoyard style and offers access to the Les Saisies ski area. The village lies in beautiful mountain scenery, and is every bit as charming in summer as in winter, making it an ideal location for both holidays and year-round living. Joyeuse, as well as being the French for "joyful", is an enchanting and historic small town that is found in the dramatic and beautiful landscapes of the southern Ardèche in south-east France. With cobbled streets and packed with arts and crafts shops and enticing restaurants and cafés, this little town is a fabulous place to explore this lesser known part of the south. La Baume is a picturesque Alpine village found in the Haute-Savoie department of eastern France. Tucked away in a peaceful corner of the mountains, the village is a haven of tranquillity and traditional Alpine atmosphere. Yet, it's only a stone's throw away from the ski slopes and nightlife of popular ski resorts like Les Gets and Morzine. The little village of La Chapelle d'Abondance lies in the French Alps, close to the Swiss border. A traditional Savoyard village, oozing charm and yet with access to some of the best skiing in Europe, La Chapelle d'Abondance is popular with those who appreciate its atmosphere and history as well as its superb location. La Clusaz is one of those Alpine resorts that sits somewhere between being a top flight ski and mountain sports resort, and a traditional Alpine village. So it's got the best of both worlds. Atmosphere, heritage and a warm village welcome combine with access to some of the best skiing in the Alps. Can it get better? Between the popular ski resorts of Morzine and Les Gets in the Haute-Savoie lies the beguiling hamlet of La Côte d'Arbroz. A peaceful corner of the Alps, calm and unspoilt, yet with access to all the lifts, pistes and après ski of the larger resorts, La Cote d'Arbroz is perfect for those who love the mountains for themselves, not just for skiing and partying. La Côte Saint André is a lovely and historic town which lies in the south-east of France, in the Isère department of the Rhône-Alpes. Its many original features include a stunning traditional market hall, and it is also the proud birth town of the acclaimed composer Hector Berlioz. The countryside that surrounds this town is as stunningly beautiful as you would expect of an Alpine area, and is as lovely in summer as it is spectacular in the winter snows. La Grande Terche is one of the Alps' better kept secrets. While many ski resorts in the region have become over popular, over built and over commercialised, La Grande Terche has somehow retained its Savoyard identity and natural beauty, allowing skiers to enjoy stunning scenery, fresh powder and uncrowded pistes. The ski resort of La Plagne is one of the biggest and most popular in France. It consists of several "villages" and lies in the Savoie department of eastern France. La Rosière is a delightful, family friendly ski and mountain resort that lies in the breathtaking scenery of the Savoie, in the French Alps. With a friendly, lively atmosphere offering something for all ages and levels of expertise, the resort combines top notch facilities with beautiful natural surroundings and traditionally styled accommodation. La Tania (or La Tagna as it was originally called) is a ski town that is found in the Savoie department of the French Alps. Purpose built to the highest architectural standards in 1990 for the 1992 winter Olympics, and set amidst the classiest and most expansive ski areas in the region, La Tania is a perfect location for ski fans as well as for lovers of a lively après ski scene and beautiful alpine scenery. Le Biot is a small mountain village that is found in the midst of the largest ski area in the Alps, yet it remains tranquil, traditional and unspoiled. Le Biot is the perfect destination for anyone who likes their Alpine retreat to be exactly that, a beautiful retreat from the stresses and strains of the modern world, yet with easy access to fantastic skiing and all the facilities of the big resorts. Le Bourg d'Oisans is a town that is found in the Isère department of France, in the mountainous region of the Rhône-Alpes, close to the great city of Grenoble. Set amidst the fabulous scenery of the mountains, Le Bourg d'Oisans is a notable centre for cycling, as it lies at the foot of the Alpe d'Huez climb made famous by the Tour de France. Le Grand Bornand is a lovely family ski resort and beautiful Savoyard village located in the Aravis Mountains in the Haute-Savoie department of France's Rhône-Alpes region. The village is noted for its pretty chalets, of traditional design and also for its picturesque setting. The village of Le Petit Bornand les Glières lies in a peaceful Alpine valley in the department of Haute-Savoie in eastern France. Hidden from the prying eyes of the world and set in stunning countryside, the village is a perfect mountain retreat. Les Allues is a small village that's part of the Meribel Les Allues ski resort. Meribel Les Allues is made up of no less than thirteen villages, with Les Allues being one of the bigger of these. The village is set in typically stunning Savoyard scenery, and offers great access to skiing and other mountain sports. Les Arcs is not so much a town as a combination of four resort villages which form the skiing and mountain section of Bourg St Maurice, situated in the Alps in eastern France. Purpose built, Les Arcs has, in the past, been criticised for its lack of original alpine charm, but in recent times many improvements have been made and a new village created. Aesthetics aside, however, Les Arcs is exactly what it was created to be, which is a superb ski resort where skiing and mountain sports are of paramount importance. Whether in winter or any season, the Alpine village of Les Carroz d'Araches is ready to exert its charms. This pretty Alpine village of the Haute-Savoie department of south-eastern France, strikes the balance between being lively but never rowdy, and offers something to keep every member of the family entertained. Part of the commune of Araches la Frasse, its links to some of the most famous ski stations and slopes of the Alps make it a great location for winter sports fans. Though come snow or sunshine, even non skiers will find plenty to do. Les Contamines Montjoie is an Alpine village and ski resort that is found in the soaring mountains of the lovely Haute-Savoie department of eastern France. The resort offers superb ski and snowboard facilities, yet retains much of its historical appearance and culture. Les Deux Alpes is a ski resort in the Isère department of the Rhône-Alpes region in eastern France. It has a superb snow record and offers glacier skiing and off piste skiing for experts. It also has an acclaimed snow park for boarders, many other adventure sports, and has a reputation for very lively nightlife. Even in summer, Les Deux Alpes has hundreds of activities on offer. The village of Les Gets, situated in the Haute-Savoie department of the French Alps, although having experienced massive development over the last ten years as a popular ski resort, is still at heart an authentic Alpine village. There is a vast population explosion in the winter months, taking the village inhabitants from a tiny 1,300 to over 15,000 in the skiing season! The resort of Les Houches is located in the Haute-Savoie department of the French Alps, in eastern France. It is a pretty and traditional village, with access to the excellent skiing of the Mont Blanc ski region. Les Menuires is a ski resort and mountain town that lies in the Savoie department of the French Alps. It has access to some of Europe's best skiing, and is set in the world's largest ski area. Les Saisies is a town and popular skiing location in the French Alps, in the Savoie department. Founded from nothing by an Austrian ski instructor, the resort now encompasses several villages and is a superb and very popular destination for mountain sports in both winter and summer. The town of Lugrin is found in the French Alps in the department of the Haute-Savoie, part of the Rhône-Alpes region of eastern France. Just ten minutes away from the lively ski resorts, Lugrin is also a delightful place in summer, as it lies on the shores of Lake Geneva (Lac Léman), and offers access to sporting and cultural activities all year round. Lullin is a "picture postcard pretty" village close to some of the best ski resorts in the French Alps. Tiny and tranquil, Lullin is simply perfect for anyone who prefers to get away from the hustle of the big resorts, yet still have access to glorious skiing and the mountain activities. The city of Lyon, France's third largest city, lies in the east of central France. It is the capital city of the Rhône department, and is situated on the confluence of the Rivers Rhône and Saône. Like Paris and Marseille, the city is divided into nine arrondissements, each having recognisable zones within them. Manigod is a lovely and authentic mountain village with fabulous skiing and all Alpine activities. Set near to the famous ski resort of La Clusaz, Manigod offers ski in ski out access to the pistes. The village is vibrant in all seasons, as beautiful in its summer greens as it is in winter under its mantle of white. Megève is one of France's longest established ski resorts, and still attracts many of Europe's rich and famous despite being situated at a lower altitude than many newer alpine ski centres. There is certainly a school of thought that proclaims Megève to be the original and the best, and the town has an undeniable charm, with its mediaeval centre and horse drawn sleighs adding to the Christmas card effect. The village of Menthon Saint Bernard enjoys a privileged position on the banks of Lake Annecy, in the French Alps. The village itself is equipped with all amenities, and it's also close to the main town of Annecy. With lakes, mountains and historic monuments all around, this lakeside village is an idyllic location for holidays. Meribel les Allues is the oldest village in the Three Valleys ski area of the French Alps. This picturesque village is ideal for those who want access to fantastic skiing or other mountain sports, but prefer to have their accommodation in a more peaceful and traditional environment than can be found in the heart of Meribel itself. Mottaret is ski resort in the Three Valleys ski area of the French Alps, and although its official name is Meribel Mottaret, it is independent from the ski resort of Meribel, which is located a few kilometres further down the mountain. With an attractive, authentic look and excellent access to the ski lifts and slopes, Mottaret is popular with keen skiers and families alike. The town of Messery enjoys a remarkably privileged position on the shores of the magnificent Lake Geneva. Set amidst the unrivalled beauty of this area of the Alps, and within reach of the best ski locations in France, Messery is truly a dream location for a holiday home. Just twenty minutes from the city of Geneva itself, it's also easy to reach from the UK. Montélimar, the home of the famous nougat is a lively and colourful town with wide Parisien style boulevards and interesting museums. Property prices are reasonable. The ski resort and village of Montriond is found in the French Alps, in the department of the Haute-Savoie. The village is charmingly traditional whilst providing great facilities and access to the largest ski area in Europe, the Portes du Soleil. Montrond les Bains is a pretty spa town that lies on the banks of the River Loire amid the green and mountainous landscapes of the Loire department of the Rhône-Alpes region. The town is within easy reach of the capital city of St Etienne. Morillon, in the Chablais area of the glorious northern French Alps, is so much more than just another ski resort. The old village itself is tiny but charming, and just above it is the purpose built resort of Morillon 1100 (Les Esserts) that provides superb entertainments and facilities in both winter and summer. Both the old Morillon and the new resort can claim to be set in one of the most spectacular parts of France, in a truly stunning location. The town of Moûtiers, in the French Alps in the department of Savoie, is known to many as the gateway town to the Three Valleys ski resorts, as this is where the TGV ski special takes people before they go onto their resorts. Moûtiers, however, is much more than this description allows, and is worth more of your time than a quick change of transport! Next time you are passing through, spend a day or two exploring... you just might want to stay! The town of Neuvecelle is located in the scenic surroundings of the French Alps, on the edge of Lac Léman (Lake Geneva). Lying close to the famous spa town of Evian les Bains, Neuvecelle, while not so well known, enjoys a beautiful lakeside location and a lively ambience. The mountain village of Notre Dame de Bellecombe is found in the Savoie department of the Rhône-Alpes, in the east of France. Picturesque and traditional in appearance and atmosphere, it's a great antidote to those occasionally less than pretty purpose built ski resorts, yet it still has access to fantastic skiing! Nyons is a market town which is found in the southern part of the Drôme department in south-east France. Lying very close to the border with Provence, Nyons is considered to be part of the Drôme-Provençal region, and as such benefits from one of the most glorious situations in France. The tiny village of Oz, or to give it its longer title, Oz en Oisans, is located amidst the beautiful and spectacular scenery of the Isère department in the French Alps. Small it may be, but it makes a great base for keen skiers as it is part of the Grandes Rousses ski area, and also offers access to the Alpes d'Huez resort among other popular skiing destinations. Passy is a large mountain town that is located in the Haute-Savoie department of the French Alps, in eastern France. The town lies close to Mont Blanc and is situated in one of the world's most famous skiing areas. Passy is popular in summer as well as in winter, and is noted especially for its pure air. Peisey Nancroix is a ski village that is located in the Savoie department of the French Alps. Due to its proximity to Bourg St Maurice, with its ski rail Eurostar service direct from the UK, the village is readily accessible and makes a great base for a skiing or walking holiday in this beautiful mountain region. Peisey Nancroix is no purpose built swish ski resort, though, rather an historic Savoyard village with a history and a heart. Peisey Vallandry is a ski resort found in the French Alps. Made up of a collection of purpose built but traditionally designed villages and also old, authentic Savoyard villages, it provides extensive pistes and top of the range facilities for winter and summer sports, while retaining a great charm and true Alpine atmosphere. The village of Pralognan la Vanoise is a traditional Savoyard village with a long history of welcoming visitors to share the delights of its winter and summer beauty. Set high in the French Alps, the village is a great place for those skiers who like to escape the crowds and enjoy excellent skiing in a peaceful environment. The picturesque and traditional Alpine village of Praz sur Arly is located in the Haute-Savoie department of the Rhône-Alpes in eastern France. The village is an ideal ski or summer destination, offering many mountain sports and being well equipped with all amenities. The town of Publier is found lying in one of France's most sought after locations, on the shores of Lake Geneva in the Haute-Savoie department of the Rhône-Alpes region of eastern France. A perfect destination for holidays, Publier offers everything you could possibly want for full-time living too, being a thriving and dynamic community offering every comfort and convenience. Romans sur Isère is a serene and beautiful old town that is set close to the Rhône vineyards of the Drôme department in the Rhône-Alpes region of south-eastern France. There is plenty of interesting heritage to enjoy, and the town is also something of a magnet for shoe lovers as it is a centre of the shoe manufacturing industry! The town lies on the banks of the River Isère and offers views of the mountains beyond. Saint Bon Tarentaise is a charming and traditional Savoyard village close to all the pistes and attractions of the Courchevel resorts. Its authenticity and calm provide a perfect retreat from the lively atmosphere of the main Courchevel resorts, yet it is only a short navette ride away. The city of Saint Étienne, situated in eastern France, is the capital city of the Loire department of the Rhône-Alpes region. Essentially a centre of industry, the city nevertheless has some interesting historical places and is also a major centre for art and design. It lies in the wonderfully diverse countryside of eastern France, where you can find everything from green hills and valleys to snow-topped mountains. Saint Gervais les Bains is a beautiful spa town which lies in a desirable location at the foot of Mont Blanc in the French Alps. The town is perfect for skiers, but also has enough natural and traditional beauty to charm even non skiers. Saint Jean d'Aulps is a small ski and mountain resort village found in the Haute-Savoie department of the French Alps. It is definitely small and friendly rather than extensive and buzzing with trendy social life, but the village is historic and authentic, the surroundings unspoiled and attractive, and the skiing and summer sports facilities are very good indeed. St Julien en Genevois is a beautifully situated town in the high French Alps, close to Geneva. Well equipped for tourism, the town offers casinos, nightclubs and mountain sports as well as some of the most dramatic scenery in France. St Martin de Belleville is a charming alpine town situated at the bottom of the Vallée de Belleville in the Savoie department of eastern France. Close enough to the Three Valleys slopes to provide excellent skiing for all levels, the town is popular with locals and holiday makers alike. The town of Saint Paul en Chablais is found in the scenic French Alps, in the Haute-Savoie department of the Rhône-Alpes region in eastern France. The town, which has an interesting heritage, also has a spectacular setting. A backdrop of mountains soaring into the sky, shimmering lakes, deep pine forests, sweet mountain meadows and wetlands provide surroundings that offer enjoyment for all and which create a truly charming ambience. Sainte Foy Tarentaise is a lovely alpine village that lies in the mountainous east of France. With its excellent small ski centre, it is picturesque and tranquil in a way that you may have thought the Alps had forgotten how to be. This village is perfect for those who truly love the mountains, the fresh air, the views, and the sense of splendid isolation that can't quite be found anywhere else on earth. The market town of Sallanches lies in the Alpine department of the Haute-Savoie in eastern France. With excellent amenities, the town benefits from its location in one of the most beautiful and dramatic places in Europe. Samoëns is a lovely ski resort in the French Alps. It is quieter than its better-known neighbours, yet offers lower property prices, traditional character and access to excellent skiing. Séez is a delightful village which is set amid the best ski resorts and scenery of the Savoie department in the east of France. Known for its traditional crafts, Séez is picturesque, interesting and perfect for enjoying winter or summer sports and leisure activities in traditional Alpine style. The Alpine village of Servoz sits in the Chamonix Valley, offering access to some of the best ski slopes in Europe. The village is utterly unspoilt and traditional, and is surrounded by glorious mountain countryside with views to Mont Blanc. The town of Seynod can be found nestling up against the lovely departmental capital of Annecy in the Haute-Savoie department of the French Alps. It is a lively and attractive town with a thriving commercial life. It has an enviable geographical position on an important crossroads between several European countries, these being Switzerland, Germany, Italy and, of course, France. The beautiful village of Seytroux sits in the heart of one of France's biggest and best ski areas, in the breathtaking scenery of the Haute-Savoie department of the Rhone Alps. Tiny and unspoiled, Seytroux offers a chance to experience a genuine Alpine ambience without the rush of tourism, yet is situated close to the major ski resorts and all the associated amenities. The lovely Savoyard village of Sixt Fer à Cheval is found in the Rhône-Alpes region of eastern France. This traditional and unspoilt village has access to fantastic skiing yet offers an authentic ambience and unrivalled beauty. Sixt Fer à Cheval also offers a rich natural and built heritage. Taninges is a lovely old Alpine town which lies under the shadow of the Pic de Marcelly in the Haute-Savoie department of the French Alps. Close to Geneva and several major ski resorts, Taninges is a great location for lovers of the mountains, whether for winter skiing, summer climbing and walking, or just for the exceptional scenery and quality of life which is offered here. Thollon-les-Mémises, a little village in the northern French Alps, is everything you could ask of an Alpine village, and more besides. Picture postcard pretty and with views so stunning that they are mentioned in the Michelin guide, Thollon-les-Mémises is an ideal location for anyone who loves lakes and mountains, in any season. Set amid the stunning mountains, meadows and valleys of the Haute-Savoie in the French Alps, is the small market town off Thônes. Traditional and oh so pretty, Thônes is set fair to give you access to the ski slopes in winter and all manner of summer activities after the melt. With its excellent shops and amenities, it's definitely a place to get to know! Thonon-les-Bains lies on the edge of Lake Léman on the French side of the border with Switzerland. With its spectacular lakeside setting and advantageous position at the foot of the Alps, Thonon-les-Bains would be a popular place even if it were not also blessed with some of the best natural mineral waters found in France. Tignes, situated in the Savoie department in the French Alps, is one of Europe's leading ski resorts. Due to its glacial location, Tignes offers almost year round skiing, closing only a few weeks each year. Tignes was once an old Savoyard village, but sadly this now lies under the waters of the reservoir, so modern "Tignes" consists instead of four purpose built villages and one surviving old village, Tignes les Brévières. Vacheresse is a small village in the Haute-Savoie department of the French Alps, part of the commune of Abondance. It has a beautiful setting, between Lake Geneva and the ski slopes of the Portes du Soleil, making it perfect for both winter and summer tourism. The village offers a mix of old and new buildings and is peaceful and perfect for escaping the frenetic activity of the ski resorts and finding some peace and quiet in the countryside instead. Val d'Isere is one of those skiing resorts whose name you know even if you don't ski. Situated in the Savoie department of eastern France, Val d'Isere has a reputation for superb skiing which goes before any other knowledge of the town. It is, however, a very attractive Alpine town, and has something to offer to everyone... even non skiers! The resort of Val Thorens, in the Savoie department of the French Alps, is the highest ski resort in Europe, and great snow is guaranteed. Val Thorens is purpose built, but has fortunately avoided the soulless expanses of concrete that blight certain other resorts of its ilk, making it an altogether more attractive proposition for property seekers. Valence, capital of the Drôme department in the south-east of France, is a magnificent old town which lays claim to being the Gateway to Provence. It is certainly easy to agree with this title, as there is a distinctly Provençal feel to the town, with the Provençal colours, the spicy scent of pine and the warm, sun-laden air. Valence, however, is equally well placed to look west to the gorges of the Ardèche or north-east to the mountains of the Alps, as well as south to Provence and the Côte-d'Azur. The gorgeous Alpine village of Vallorcine occupies a picture postcard location in the Chamonix Valley in the French Alps. With its air of calm and its traditional look, Vallorcine is the perfect destination for families, keen skiers and anyone who wants to enjoy an authentic Savoyard atmosphere. Valmorel is a lovely, family orientated ski resort which is found in the Savoie department of the French Rhône-Alpes region in eastern France. The village, which was actually purpose built in the 1970s, is of traditional design, with typically Savoyard chalets rather than high rise concrete apartment blocks, making it one of the prettiest villages in the area. Valmorel has good access to the slopes and maintains a very pleasant friendly atmosphere. Verchaix is an old Alpine village and ski resort that is found in the Haute-Savoie department of eastern France. Small and authentic, the old village offers a taste of traditional Savoyard life as well as providing a great base from which to enjoy the modern facilities of the big ski stations of the area. The views from Verchaix are typically Alpine and utterly beautiful, in winter or in summer. Villefranche sur Saone is a large town in the Rhône department of the Rhône-Alpes. With its river port and wine trading activities, the town is of considerable economic importance in the region. It's also deeply historic and has much to offer in terms of heritage and amenities. Although lesser known for tourism, Villefranche sur Saone is an excellent destination for holidaymakers as it is set in a beautiful countryside with many activities to hand. The Rhône-Alpes region is in the south-east of France. It contains many of France's finest ski resorts in the French Alps. WHICH DEPARTMENTS ARE IN Rhône-Alpes?